« Do I detect an “attitude”? This cartoon is ©2008 Record Searchlight. Used pending permission. This entry was posted on June 4, 2008 at 4:45 pm and is filed under Webcomics. You can subscribe via RSS 2.0 feed to this post's comments. You can comment below, or link to this permanent URL from your own site. 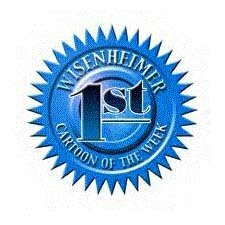 Congratulations on the cartoonist honor! Well deserved. As for whether or not you’ve been cranky/irritable lately — I can say from experience it’s scads more fun to write about the annoying things in life than it is to write about sunshine, lollipops and rainbows. More fun for your readers, too. So keep up the good work. Eat plenty of fiber. Carry on.